Gulf Shores, Alabama entrepreneur Joey Ward builds a small, community zoo on a family-owned parcel of land in the heart of town, a mile from the beach. Zooland Animal Park becomes home to a collection of tropical birds, snakes, big cats and other exotic wildlife, run by a small staff of zookeepers. While Zooland is extremely popular with locals and vacationers, Gulf Shores isn’t the tourist hot spot it is today, and the zoo is only a seasonal attraction. 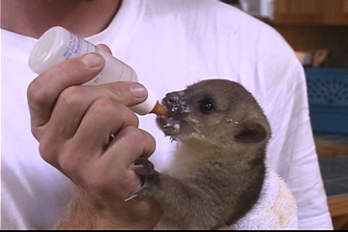 However, Joey and his parents, Wade and Pat Ward, are devoted custodians of the zoo’s animals. The Ward family forms a non-profit charitable organization, The Zoo Foundation, Inc. to operate the park, and the Wards continue their generosity and dedication to the zoo. Alabama transplant Patti Hall walks through the gates of the zoo to become a volunteer. Her passion for animals and professional credentials in management, administration, education and public communications puts her on a path that will dramatically change the zoo’s fate forever. Joey Ward and the Zoo Board of Directors asks Patti Hall to take over as Zoo Director. The following year, while running a zoo now filled with hundreds of animals, Patti faces her first big challenge living on the Gulf Coast, with the arrival of Hurricane Georges. Realizing that yearly tropical storm season is a new way of life, her dedication to the zoo’s animals means that their safety and security takes precedence over everything else. Little does she know the true test she will face a few years later. Patti hires Cyndi Johnson as Head Zookeeper who will later become the zoo’s Curator. Patti’s primary responsibility is to keep the zoo operational and open during tourist seasoning in order to make enough money during the spring and summer months to survive through fall and winter, the off-season. She holds raffles, bake sales, even raids zoo vending machines to pay the bills, feed and care for the animals and stay operational. Patti and the Board decide to rename the zoo to bring more credibility and prestige to the organization. The Alabama Gulf Coast Zoo is officially born. Each tourist season, Patti launches various zoo programs, including: educational animal visits to schools and libraries, community events, and promotions aimed at tourists. She turns “Boo in the Zoo” into a monster Halloween hit drawing over 2,500 annual attendees, and makes many improvements to animal exhibits, the gift shop, and the facility grounds. By the end of summer, the zoo has its best season ever. 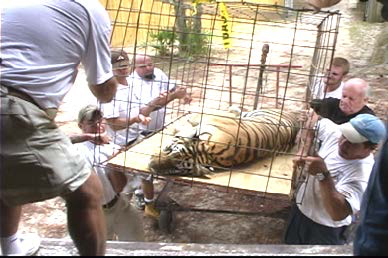 Then, an unbelievable twist hits the Alabama Gulf Coast Zoo and turns its world upside down and inside out. On Monday, September 13th, CBS news anchor Dan Rather announces that a deadly Category 3 hurricane named Ivan is heading toward the Alabama coast. Patti, her head zookeeper Cyndi Johnson, and the zoo’s facilities manager Rusty Gilbert know what’s coming and it’s bad. Gulf Shores will likely be the bullseye, and a mandatory evacuation has been ordered for thousands of residents. But what about hundreds of zoo animals? Patti is certain they will not survive the deadly storm if they are left behind. No US zoo has ever been completely evacuated for a natural disaster, until the Alabama Gulf Coast Zoo. Over 36 hours, Patti and her staff pack up over 265 animals and transport them 20 miles inland to her home and property where they, her staff’s families, and their pets, all hunker down to wait out Hurricane Ivan. There is one animal they must leave behind - the zoo’s mascot, Chuckie, the 11-ft. 1,000 lb. American alligator who they hope will survive in his swampy exhibit. On September 16th, Hurricane Ivan makes landfall. 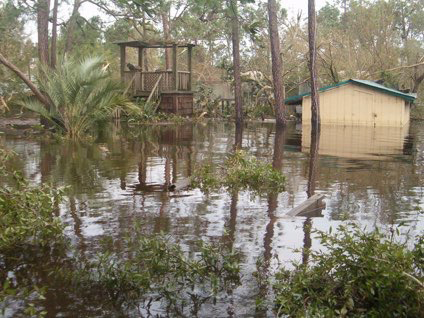 The Alabama Gulf Coast Zoo is completely destroyed and under 14 feet of water from the Gulf of Mexico. 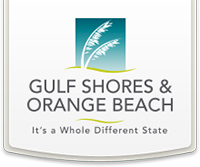 The towns of Gulf Shores and Orange Beach are also demolished. In the aftermath back at Patti’s house, there is no municipal power or running water, cell and telephone service are down, and they have a very limited supply of food and bottled water for the staff and the animals. They are completely dependent on a few small generators and cut off from all emergency services. The temperature and humidity are in the high 90’s to add to the misery. In spite of the direness, they had all survived the worst natural disaster to hit the Gulf Coast in 25 years. Yet, the animals of the Alabama Gulf Coast Zoo are now all homeless, and Patti’s staff has no idea if their own homes are still standing. But not one animal life is lost in the transport or during the relocation, and no zookeeper has been injured, except for Patti who received a monkey bite on her finger. The bond between animals and keepers during this extraordinary undertaking is beyond description. In the aftermath of Hurricane Ivan, word spreads about Patti’s historic rescue mission and for the zoo’s desperate search for Chuckie, the alligator who has gone missing. The national media comes calling. NatGeo, People magazine, The Weather Channel, CNN, Good Morning America, local TV and radio stations and countless newspapers report on and interview Patti. 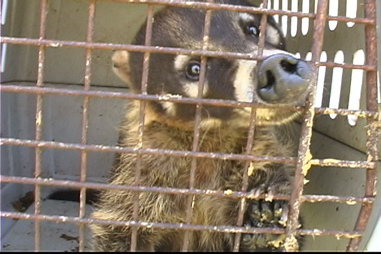 Lifting their spirits, Chuckie is found safe and sound, and this little zoo in Alabama becomes a big story. It is one particular appearance that starts Patti and the zoo on another fateful journey no one would ever believe possible. 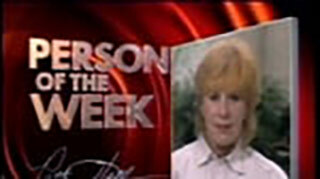 A few days after the evacuation, Peter Jennings of ABC World News features Patti as his Person of the Week, “…And so we hail Patti Hall…shelter from the storm.” As it happens, Los Angeles documentary TV producer Julie Leifermann watches the segment and makes note of this compelling story. 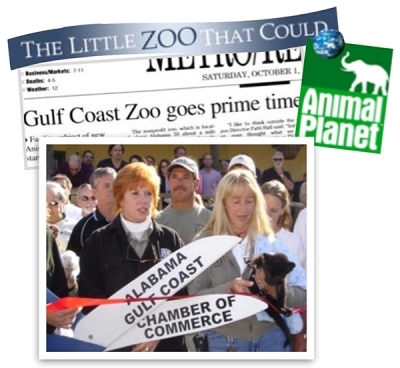 Six months after the Alabama Gulf Coast Zoo has survived Hurricane Ivan, TV Producer Leifermann looks up Patti and the zoo and finds that they are struggling to rebuild the zoo facility, but the animals are all there, happy and healthy. Within weeks, a 13-episode TV series is developed and sold to Animal Planet and Leifermann’s L.A. production company converges on Gulf Shores to bring this heroic and touching tale to a global broadcast audience. At the start of shooting, they all endure two more evacuations for Hurricanes Dennis and Katrina, but Patti and her staff are determined, in spite of setbacks, to complete the rebuild and reopen the Alabama Gulf Coast Zoo. On February 15th The Little Zoo That Could debuts on primetime TV and America falls in love with Patti Hall, her amazing zookeepers, and about 300 of the most charming zoo animals you could ever meet. Monetary donations pour in as viewers witness the inspiring dedication of Patti and her staff lovingly care for their animals while attempting a comeback of the zoo. Hope turns into triumph and the Alabama Gulf Coast Zoo is able to open its doors only 14 months after being completely destroyed. It becomes known as The Little Zoo, a “must-see” place on the map, and tourism comes roaring back to the town of Gulf Shores and its neighboring communities still recovering from the hurricanes. By the end of 2006, the zoo has the most successful season in its history. Life is still precarious. June to November is hurricane season. The reconstructed zoo sitting atop swampland covered in sand on a barrier island cannot survive another powerful storm. It is a ticking time bomb. The only long-term solution is to move to safer terrain and build a new zoo. An impossibly expensive, complicated dream. But thanks to another Gulf Shores family, this isn’t going to be a far-fetched dream. Animal-lovers Clyde Weir and his daughter Andrea are deeply touched by The Little Zoo TV series and want to help in a big way. 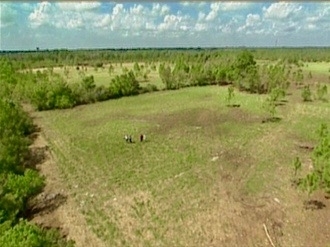 They stun Patti with a gift to the zoo of 25 acres of prime Gulf Shores real estate located four miles off the island. However, designing and building a new multi-million dollar facility is a complicated endeavor, and over the ensuing years, the enormous resources and commitments required by a non-profit zoo, make it very difficult. By 2008, The Great Recession adds to this challenge. The worse man-made disaster to hit the Gulf, the Deepwater Horizon Oil Spill puts Patti’s dream zoo into a deep freeze. The beach communities of Alabama take a devastating hit from the spill, as do their tourism business. Fundraising for a new zoo comes to a grinding halt. Coping with yet another disaster, Patti is determined to keep the Alabama Gulf Coast Zoo viable. She makes improvements, trains new staff, and adds new educational animal encounters and stage shows. Her idea is that during hard times, people need some joy to lift their spirits; an escape that is a good value for their money; a safe, kid-friendly place that feels like a happy family. A charming little zoo filled with hundreds of adorable animals is just the ticket…as long as a hurricane doesn't show up. In a brilliant attempt to raise awareness about the environmental impact the oil spill had on wildlife, the new zoo team developed a design concept that would place the Alabama Gulf Coast Zoo at the forefront of conservation and sustainability as a fully operational green zoo. But again, their efforts to raise enough capital were hampered by slow economic recovery. This ambitious plan was not to be. But as they always did under Patti’s leadership, they re-grouped and continued to build on the current zoo’s success. An important alliance is made with renowned animal expert Jim Fowler who assists Patti with a more feasible design path for the new zoo. In another amazing twist of fate, Joey Ward, the same person who built Zooland Animal Park meets Jim Fowler. Twenty-seven years later, Wade and Pat Ward financially jumpstart another new zoo construction project. Joey Ward is overseeing construction of the new Alabama Gulf Coast Zoo in its new location and Patti Hall is on the brink of living her dream - The Little Zoo That Grew, safe and sound, once and for all. Circle of life, indeed.